How Should You Dress for Your Physically Demanding Job? — Anna Akbari, Ph.D. They say to dress for the job you want, rather than the job you have. Yet, what about when the job you want sits in an office all day and the job you have is highly active and involves running around and lifting things? How should you dress for your physically demanding job? Where is the balance? The era of the business formal office is largely gone. Unless you work in finance or law in New York, chances are that your office dress code has gotten a bit more laid back than designer suits and cufflinks. Companies like Google and Apple are turning casual dress in offices into the new normal. 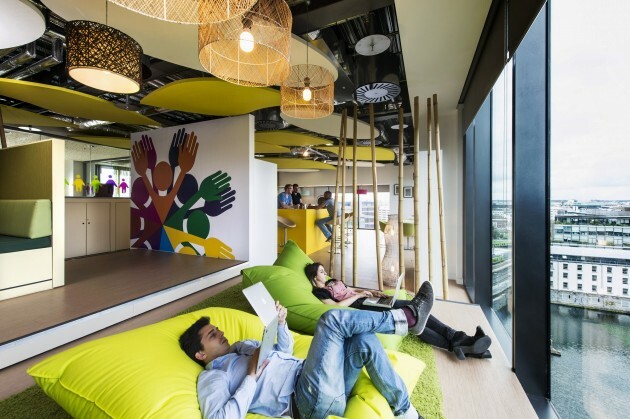 Google uses a casual dress code and office environment to boost creativity. Other companies, such as Pixar and Facebook, are also well-known for their laid-back office style. Many of these companies take the perspective that allowing employees to dress however they want gives them room for creative freedom and allows their energy to be completely focused in that direction. I work in a particularly casual industry: television production. The nicest anyone is expected to dress is in jeans and a blouse. Yet, when you’re running around and lifting heavy boxes, is that even a realistic option? When does dressing for the job you really do become unprofessional? Ripping your pants is a real concern when you are lugging sound equipment up staircases or boxes of paper over your head. I had this dilemma myself when starting to work in a new, more active position of television production: the Production Assistant (PA). I made this choice on my first day at a new show, and showed up in black workout pants and a nice blouse, knowing I would be doing heavy lifting all day. At the end of the day, my boss politely asked me to dress a little nicer in the future. I will be honest: this puzzled me. Mostly because I had put together what I thought was a work-appropriate outfit, given the tasks at hand. I felt like I could easily do my job in these clothes. Jeans would be too restrictive for heavy lifting and running and too warm for running around outside in Los Angeles all day. Yet, what I realized is that I had taken my dress cues from the women who worked strictly on set: black workout pants, black tennis shoes, and a blouse. However, as my job involves some time in the office (where jeans are the uniform) and some time on set, this look didn’t fly on me. In the end, I developed a uniform of very stretchy jeans, black blouses and cardigans, but I still felt like I was dressed MUCH nicer than the guys I worked with. If I put on baggy cargo shorts and an old t-shirt (as they were wearing), I’m sure I would look far less put-together than in my workout pants with a nice blouse. So why is the standard for women different than men? I won’t jump to the conclusion that they were being sexist. There could be a lot of reasons I was asked to dress more formally. When asking me to dress nicer, my boss mentioned that he really wanted me to make a good impression on everyone, so one possibility is that I was told to dress more formally because my boss wants me to succeed and make a good, and noticeable, impression on everyone. It is also possible that, as the only female PA, they were unsure of where the practical vs. professional line stood with women. Low necklines and tight pants are a concern for women when purchasing work clothes – and that doesn’t really exist for men. Regardless of the other PAs and their wardrobe choices, standing out and looking more professional/put together is hardly a bad thing, as long as it does not limit your functionality. I stuck with my new ‘uniform,’ knowing, at the very least, that I would look nice. If you care about your job or career, any confrontation with a boss or higher-up should be thought through carefully. In my particular case, making an argument would not have been worth it. The opportunity for the position meant a lot to me and arguing over clothing would have made a bad impression. I will probably never know what my boss was thinking when asking me to dress more professionally. However, I know making a scene about it wouldn’t have gotten me anywhere, except possibly fired. I would rather just put on a cardigan. Ask Lots of Questions: Does the job involve running around and doing any kind of physical labor? Typically you wouldn’t be expected to do this in a skirt and heels. Yet, if you want to make a good impression, ask your boss for guidance to make sure you look appropriate. Before my first day on that job, I was told to dress “comfortable.” I did just that and the statement was then taken back and I was told to dress “professional.” Ask detailed questions to avoid this problem. Know your 'Superiors.’ They may not be your direct bosses, but the higher-ups in your office are bound to see you. Take notes of their job descriptions and how they dress. Are they out-and-about a lot or do they stay in their office? How does it affect what they wear to work? If the job you want involves sitting in an office, and the woman currently holding that job wears nice dresses and heels, but you’re running around the city getting her lunch, you can’t do the same. Just aim to be put together and find a balance in between how you need to dress and how they dress. If she is wearing heels and a dress, wear a nice blouse with your comfortable pants and the most comfortable, yet professional looking, shoes you can find. Dressing for the job you want could work against you. You may think you can wear heels and a suit and you’ll be fine, but most men aren’t going to let a woman in a dress and heels carry a fifty pound box of paper up three flights of stairs. Yet, no woman trying to make her career wants a man to feel bad for her and try to take away her cumbersome tasks out of pity! While looking put together is important, dressing practically will also help people take you more seriously to get the physical parts of the job done. It’s all about balance. Try these pants from Betabrand. They look professional, but are stretchy enough for yoga practice. Also, if you have to carry 15 coffees, chances are you’re going to spill at least a little. Avoid troublesome fabrics like silk and stick with cotton blouses. Loft always has nice options in easy-to-clean fabrics.